With the NHL draft lottery set for Saturday night, we will get clarity on two fronts. One, we will find out who is choosing No. 1 overall at the draft in Dallas on June 22. Two, we will find out which team will select Swedish defenceman Rasmus Dahlin with that first overall pick. Because winning the draft lottery and getting Dahlin are one and the same. It’s not even up for debate. Dahlin was the unanimous choice of TSN’s panel of 10 NHL scouts in the preseason rankings in September, as he was in the mid-season rankings in late January and now yet again in the Draft Lottery Edition Top 15 rankings that have been compiled specifically in honour of Saturday’s lottery. There is no reason to believe he won’t be No. 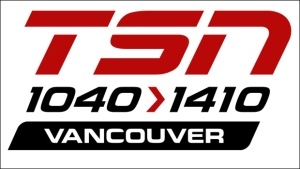 1 on TSN’s final rankings, which are released the week prior to the draft. In fact, the Big Four in this year’s draft — Dahlin, Russian winger Andrei Svechnikov, Czech winger Filip Zadina and American winger Brady Tkachuk — hold down the same spots as they did at mid-season. Svechnikov is No. 2, Zadina No. 3 and Tkachuk No. 4. While there was technically no change at the top of the rankings, there have been some subtle shifts worth noting. If anything, Barrie Colt winger Svechnikov seems to have solidified his position as the consensus No. 2 pick in the draft. Nine of 10 scouts surveyed this week had him at No. 2. In January, the same panel of scouts gave him only six second-place votes. And while both Halifax Moosehead winger Zadina and Boston University winger Tkachuk remain solidly in the consensus top four, there were a few more scouts who slid a defenceman into their top four at the expense of either Zadina or Tkachuk. London Knight defenceman Evan Bouchard, for example, was No. 3 on one ballot and No. 4 on another. Acadie-Bathurst Titan blueliner Noah Dobson was No. 4 on one ballot. They are the only Canadians in the Top 10. Bouchard was the very clear No. 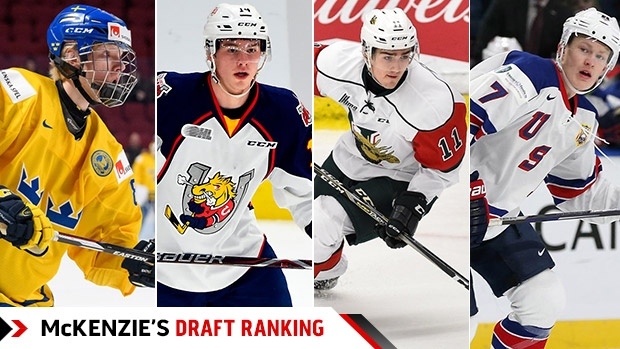 5 prospect on the Draft Lottery edition rankings, a notable cut below the Big Four but also notably ahead of the rest of the draft class, including the three other defencemen who appear locked and loaded as Top 10 picks this year. Swedish defenceman Adam Boqvist dropped one spot, from No. 5 to No. 6; QMJHL blueliner Dobson remained at No. 8 and University of Michigan freshman defenceman Quinn Hughes dropped from No. 6 to No. 9. U.S. forward Oliver Wahlstrom moved up to No. 7 on the current rankings. He was No. 9 in January. Finnish forward Jesperi Kotkaniemi rounded out the TSN’s Draft Lottery Top 10. There are a couple of other notes worth mentioning on the makeup of the Top 10. There was almost nothing separating Boqvist, Wahlstrom and Dobson in the spots between six and eight. They appear to virtually interchangeable, based on voting results. And while there was a little bit of separation between those three and Hughes at No. 9, understand one thing about this year’s draft: Based on our survey, there is a huge drop off in consensus after No. 9. Kotkaniemi, though he was just one spot below Hughes, didn’t receive anywhere close to the same support. Kotkaniemi is closer to being an interchangeable part with the next three prospects, ranked Nos. 11 through 13. That group, in order, includes Drummondville Voltigeurs centre Joe Veleno, Soo Greyhound centre Barrett Hayton and Spokane Chiefs defenceman Ty Smith. Veleno moved up four spots from mid-season rankings; Smith dropped three; and Hayton remained in the same No. 12 slot. Veleno, Hayton and Smith are all Canadians, giving Canada only five prospects in the Top 15. The remainder of TSN’s Top 15, which actually ends up being a Top 16 because there was a dead heat for the final spot, looks like this: U.S. forward Joel Farabee at No. 14 and a pair of Russian wingers, Grigori Denisenko and Vitali Kravtsov, tied at No. 15. Farabee moved up two spots from mid-season while Denisenko and Kravtsov made huge gains, from Nos. 21 and 39, respectively.